Very little of the wording of the ULT Declaration came from Mr Crosbie himself, as the majority of it is a compilation of statements by HPB and WQJ quoted from various sources and publications. It’s thought that Mr Crosbie probably derived his inspiration for the name “United Lodge of Theosophists” from these two phrases or terms used by his Teacher. The phrase towards the end of the ULT Declaration which says “to fit themselves, by study and otherwise, to be the better able to help and teach others” reflects a phrase which is quoted as part of a Pledge in an article titled “The Meaning of a Pledge” which was published by HPB in “Lucifer” magazine. 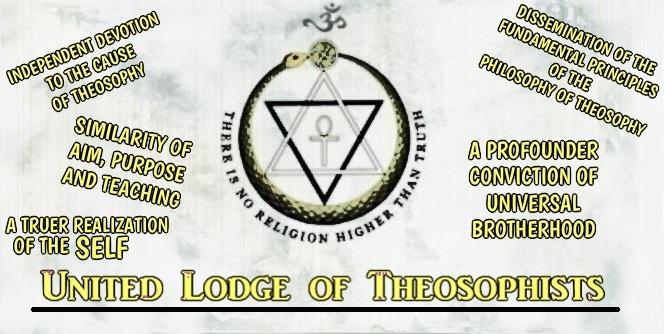 OTHER ARTICLES ABOUT THE ULT AND ITS WORK: The Four Branches of the Theosophical Movement, The United Lodge of Theosophists, On Anonymity and Impersonality, The Man Who Rescued Theosophy, The Commitment of the ULT, What it means to be an Associate of the ULT and The Theosophical Society is Disloyal to Theosophy.